Warts are benign growths caused by the HPV (Human Papillomavirus). They are spread through skin to skin contact or by an object that was touched by a wart. They are most commonly found on the hands, feet, and face. The kind of wart is determined by its location and what it looks like. Verruca Vulgaris are most common on the hands especially on the fingers, around the fingernails or back of the hands. The best description is a cauliflower looking bump on the skin. They often have seed looking dots in the middle that are blood vessels. Verruca Plantaris are most commonly found on the soles of the feet. They tend to be more flat and growing inward due to the pressure of walking. They also can have seed looking dots in the middle that are blood vessels. Flat Warts are more commonly found in the beard area on men, on women’s legs, and children’s faces. They are more flat and smooth in comparison with other warts. Filiform warts grow more commonly on the face. They look like thin protruding fingers. 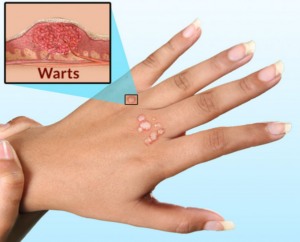 Warts can resolve without treatment. Please call and schedule an appointment to discuss the best treatment for you 208-522-SKIN (7546).